This title, “The Ten Commandments of Safe Herbal Practice,” is a little bit tongue in cheek. As most of my students know, I’m not a big fan of rules, one-size fits all pronouncements or gross generalizations when it comes to herbal medicine. The practice of herbalism around the world and throughout history is diverse and ever changing. Plants are so very complex, with their hundreds and hundreds of phytochemicals, the different conditions under which they are grown, the many ways they can be prepared and consumed or combined into formulae, they are, in fact, more chemically complex (and less predictable) than pharmaceutical drugs. Humans are so very complex. The interaction between plant and human, with a practitioner in the mix. is, well, complex. Can it be overwhelming to sort through all this information? Yes, it can. Give it a try. Welcome the complexity. Herbal Medicine is never boring. So, my 10 Commandments. They are not a simple little list of rules you can memorize and check the box marked “I read about herbal safety.” Think of them as topics for further exploration in your herbal studies. Each item below offers an important, fruitful and frankly, pretty interesting aspect of herbal medicine to explore. Check out the print resources and links to online information to learn more. I welcome questions in the comments section. 1. If it sounds too good to be true…it is! Using large doses of obscure or exotic herbs to “naturally” get high, lose lots of weight , stay up all night, make you a sexual superstar, or give you a cheap abortion is a recipe for trouble. 2. Know exactly what herb you are harvesting when you make medicine. Furthermore, take the time to learn the conventions surrounding what part (s) to use and when to harvest. 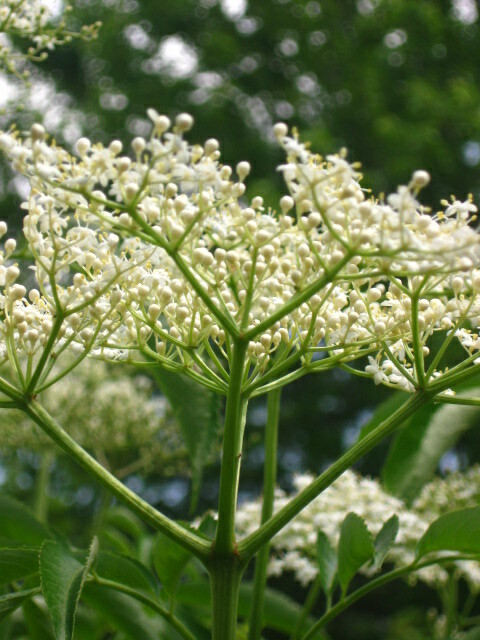 Some plants like Elder, have safe parts (flower and berry) and stronger parts (root or stem) that have predictable nasty side effects (like vomiting or diarrhea). Plant id is a lifelong study. If you plan to give your medicine to other people; devote yourself to always learning. If you aren’t sure—don’t pick it! Elder. (Sambucus nigra) The blossoms are gentle enough for infants. Did you know that the bark and root are emetic and purgative. That means in sufficient doses you lose stuff from both ends. 3. Use microdoses, low doses or lowest effective doses. Devote yourself to becoming a master of your Materia Medica. Better to know 12 herbs inside and out, than work with 100 that you know very little about. The more skillful and specific you are in assessment and prescription, the more successful you will be with lower doses of herbal preparations. 4. During pregnancy: In general you can use most herbs you normally use but use lowest effective dosages and do your research. In my practice I avoid strong blood movers, known abortifacients, really strong laxatives and a plants with have very volatile oil or potentially toxic/irritating/dangerous volatile oils. Think twice and then think some more before you recommend high dose regimens of herbs to induce labor. Pregnancy/lactation are NOT times for cleansing or detox regimens. You can read about the herbs I recommend avoiding in pregnancy here. 5. Exercise extreme caution when administering herbs orally to individuals who have had an organ transplant or are on medication(s) for cardiovascular disease. Some of the most worrisome, documented adverse events involve otherwise safe herbs that interact dangerously with anti-rejection or blood thinning medications, which have a precisely calibrated, narrow therapeutic window. 6. Learn about Pyrollizidine Alkaloids and exercise caution: It appears to be true that PZ alkaloids are bad for humans and in high enough doses can cause the awful condition of veno -occlusive disease, characterized by abdominal pain, edema, ascites, hypertension, jaundice, cirrhosis or cancer. Common herbs with PAs include Comfrey, Coltsfoot and Borage (herbs that seem gentle and helpful in many ways). Learn more about this complicated and important topic and decide for yourself if and how you choose to use these herbs: microdose oral, short term only, topical only, or not at all. Here’s a nice article on the topic by David Hoffmann to get you started. 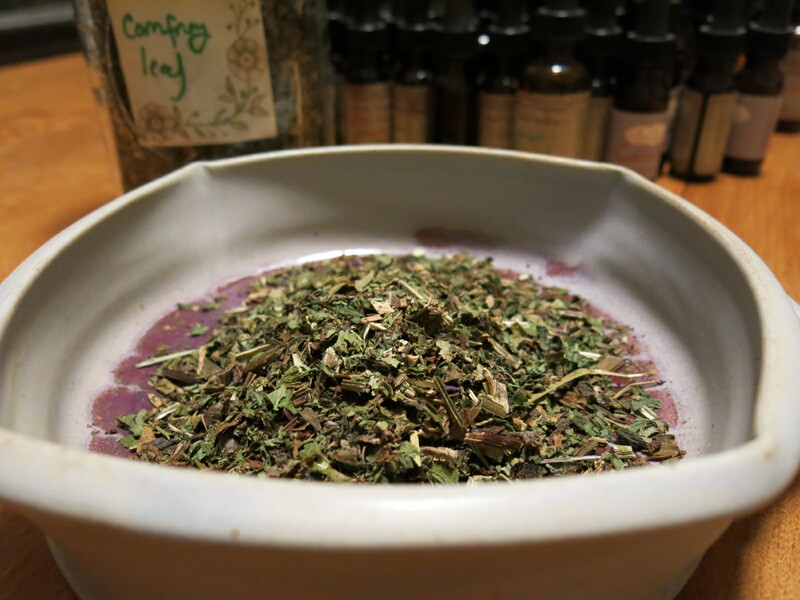 Traditionally beloved herb, Comfrey, is very controversial in the contemporary herbalism. Comfrey contains pyrollizidine alkaloids, that can cause severe damage in the liver. Leaves contain less alkaloids than the root and external use poses little to no risk. 7. Before surgery: It may be prudent for those undergoing serious surgery to lay off the megadoses of St. John’s Wort (or other herbs) for a week or so before surgery or general anaesthesia. This is not to say you can’t or shouldn’t have a cup of Chamomile tea before bed or take a few drops of elecampane because of a sinus infection, just discontinue the regular consumption of large doses of herbs and other supplements. 8. Adverse reactions more common in polypharmacy, that is, the use of many substances at one time. Those on lots of herbs and multiple pharmaceutical drugs and recreational drug and/or alcohol use have a higher risk for adverse events. Subsequently, it is more difficult to determine the offending herb, supplement or drug. 9. Know the symptoms of allergic reaction and properly differentiate from a transient treatment reaction, aka healing crisis or a simple case of “this herb doesn’t agree with my constitution”. For instance, facial edema or development of eczema in someone who normally doesn’t have eczema is likely an allergy, but if your acne gets a little worse during PMS time during the first month on herbs: not an allergy. When in doubt, simply suggest discontinuing use of the herb. While theoretically anyone can have a severe or anaphalactic reaction to anything consumed at anytime, in reality people who have a history of anaphalactic reactions (to anything) are more likely to experience these reactions again, even in response to an herb or food to which they have never been exposed. 10. Be aware that there are multiple confirmed accounts and studies of imported TCM and Ayurvedic herbal preparations that have included adulterants including other chemicals and pharmaceuticals like caffeine, prednisone, diazapem, bartbituates and others and heavy metals including lead, arsenic, cadmium and mercury. Maybe you want to buy your Chinese herbs made in America, so to speak. 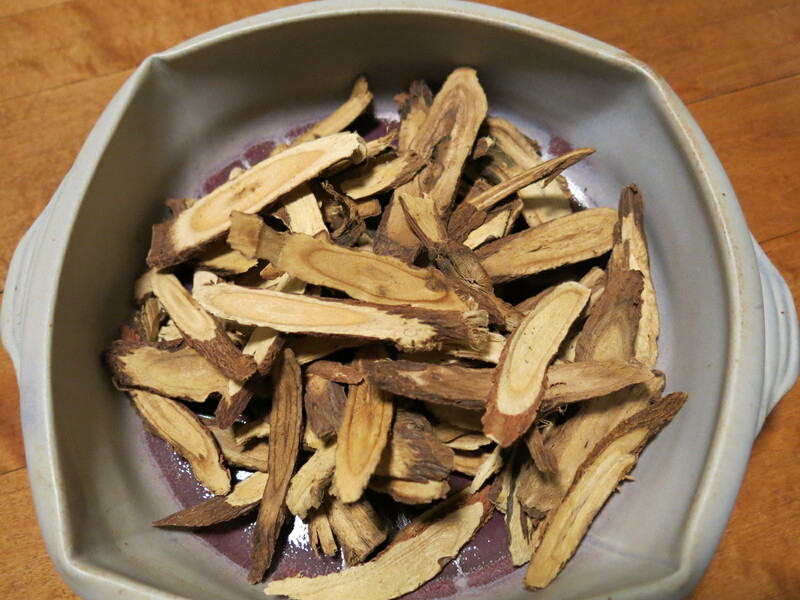 Licorice Root: If you can’t grow it yourself, order Licorice Root and other TCM herbs as single bulk herbs (not in formula, capsule or pill) organically grown and sold by a reputable company. Bulky herb purveyors should test the herbs they import and sell for dangerous substances like chemicals, sulfites, pesticides and heavy metals. Hoffmann, David. “Toxicity, Contraindications and Safety.” A chapter from the book Medical Herbalism.. The Science and Practice of Herbal Medicine. (This is a great text by a very respected herbalist. It is worth every penny. This chapter also offers a good introduction to the topic of pyrollizidine alkaloids). Mills, Simon and Kerry Bone. The Essential Guide to Herbal Safety. (2005) ( My favorite text on herbal safety. It features a comprehensive introduction to this subject and monographs of many common herbs). Upton, Roy and Aviva Romm. “Guidelines for Herbal Medicine Use.” ( A chapter from the book Botanical Medicine for Women’s Health. (2010) A great chapter on this topic in must-have, comprehensive book). This article by author and Ayurvedic practitioner Alan Tillotson is a good introduction to herbal safety, including herbs that interact with blood thinning meds, allergies, and straight up posionous herbs, among other topics. American Herbal Products Association. www.ahpa.org The AHPA’s Botanical Safety Handbook is a hefty $119, however a half dozen monographs including SJW, Fennel, Basil, Peony and others are available for free on the website. American Botanical Council. www.herbalgram.org Most ABC material are also quite expensive however, there are several free monographs (including Garlic, Ginkgo, Ginger, SJW, Saw Palmetto, Black Cohosh and others. Search in the Expanded Commission E and the ABC Clinical Guide. Thank you for sharing this! Such wonderful information. Thank you! I checked out your blog as well. Your photos are gorgeous!